Helicopters’ history can help us better imagine drones’ future. An MQ-9 Predator B takes off at Fort Huachuca in Sierra Vista, Ariz. At right, a man uses an iPad to control a Parrot AR.Drone during the International Toy Fair on Feb. 2, 2011, in Nuremberg, Germany. This article arises from Future Tense, a partnership of Slate, the New America Foundation, and Arizona State University. On Tuesday, May 7, Future Tense will host an event in Washington, D.C., on the use of drones in the United States. For more information and to RSVP, visit the New America Foundation’s website. You don’t see many stealth passenger jets flying from JFK to LAX. Stealth technology, though useful to the military, is irrelevant to Delta or United. This is rather obvious. But the advantages of piloting an aircraft from the ground are less clear-cut. You can make a smaller airframe; it might also be able to stay in the air longer. If you are inclined to fly over hostile territory (as militaries sometimes are but airlines aren’t), remote control gives you additional margins of both safety and political latitude. But there are also drawbacks. You still need to pay a pilot on the ground, and that person won’t be able to perceive the environment around the airplane nearly as well. You need to either set up a costly satellite data link or have a mobile command station for the pilot within the rough vicinity of the drone being controlled. Getting rid of the pilot can be a surprisingly expensive proposition. As the charged debate over the role of drones in American airspace unfolds, it is a mistake to overlook the simple fact that the trade-offs that have made drones so appealing to American military and intelligence agencies overseas are substantially different than those at hand domestically. Drones are not better than other, older means of gathering information, or of flying. They are different—better in some ways and worse in others. There is a peculiar alignment of intellectual motivation among drones’ most ardent proponents—the people who are selling them—and their ardent foes in the civil libertarian and pacifist communities. Both believe that a sky crowded with drones is a realistic possibility, either to be desired or feared, and both overstate the significance of drones. One hears little about the danger of government officials, eager to get ahold of the latest gadgets, carelessly spending money on drones that actually aren’t as useful as they claim to be. In some ways the current fever over drones resembles discussions of the helicopter in the middle of World War II. Early helicopters had been built before the war, but the technology came of age when Igor Sikorsky began building large numbers of them for the American military during the war. As Samuel Solomon, the president of Northeast Airlines, told the Associated Press in 1943, “The helicopter has tremendous possibilities.” Solomon prophesied air taxi services in which helicopters picked up businessmen on a rooftop in Boston and dropped them off “on the roof of an office in downtown New York.” Helicopters would also be used for express air-mail services, he said. Of course, none of this came to pass, for one simple reason: Helicopters could do all of these things, but they could not do them cheaply or efficiently enough to displace other technologies. In war zones, where getting from place to place is dangerous and moving quickly is necessary, helicopters have become ubiquitous. 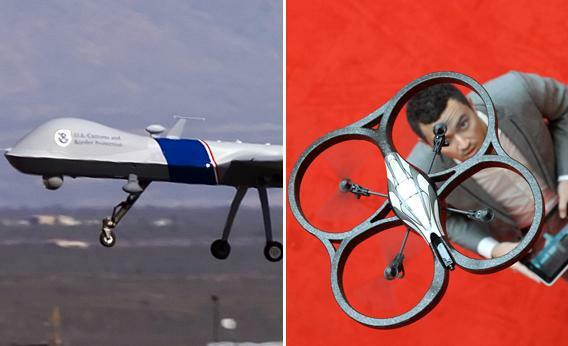 Similarly, drones are widely used on battlefields (overt and covert) because of the unique capabilities they bring. But these capabilities are not cheap. The analogy to helicopters appears to break down at one crucial point: It is possible, today and in the near future, to make small, cheap drones. But these small drones have more in common with model aircraft, which have thrived as a niche hobby for years, than they do with the Predators of Afghanistan and Yemen. Endurance is a crucial question here. Small, cheap drones’ ability to remain in the air for long periods of time will not dramatically improve in the near future. This is because their endurance is limited by the ability to store energy, an area in which technological leaps are unlikely. Larger drones are large for a reason—they can carry enough fuel to stay aloft for long periods, and the complicated sensor packages they carry can be minimized only so much. Because few see them up close, we tend to mentally underestimate the difference between a Global Hawk, which weighs as much as a tractor-trailer; a Predator, which weighs as much as a small car; and the hobbyist-sized drones that are widely available. Take the Draganflyer X6 drone. The Seattle Police Department recently purchased two of them, but after public outcry, it returned them to the manufacturer, unused. The X6 can loiter in the air for just 20 minutes or so. This is enough to be useful to police in, say, searching for a suspect fleeing a crime scene. (Which, it hardly need be said, is a legitimate police function.) The Draganflyer’s endurance is not long enough to fundamentally change the nature of privacy, in the way that Predators, Reapers, and Global Hawks equipped with sophisticated military sensors are capable of doing. Small drones like the Draganflyer can invade privacy, but they do not threaten its very existence. The greater risks to privacy come from technologies that indiscriminately gather information about everybody and only later seek to tease out information about people whom the government claims legitimate reason to investigate. This is true of persistent aerial surveillance. Internet traffic monitoring, large-scale eavesdropping on telephone calls, and collation of positional information derived from cellphones invite similar risks. Furthermore, the utility of long-duration surveillance rests not solely on the aircraft themselves but on sophisticated systems for analysis of the data. Images alone do not tell the story. But it is hard to get people worked up about image-processing software and easy to stoke fears of robot airplanes in the sky. Neither hobbyists who have bought small drones nor most state or local law enforcement agencies have the capability to effectively manage a deluge of data. The federal government is another story. But here, too, the lessons of overseas use of drones are misleading, for different reasons. Drones have changed the manner in which the American government projects power around the world. For both political and operational reasons, they have allowed the government to wage war in distant places where access is otherwise limited. This is simply not a factor in American skies, which are open to American government aircraft. Over American soil, surveillance by manned aircraft is potentially just as threatening to privacy, and potentially cheaper. A ScanEagle drone is perhaps the cheapest drone that has the endurance for persistent surveillance. It can loiter for about 24 hours. Insitu Inc., the Boeing subsidiary that makes the ScanEagle, sells it for about $100,000. A ScanEagle can carry a payload of about 7 pounds (depending on how much fuel it also takes up). The ScanEagle’s imagers are capable enough, so it isn’t that drones are unable to threaten privacy. However, $100,000 will also buy a Cessna 180, which requires a person in the cockpit. A Cessna 180 can carry a payload of about 1,000 pounds, allowing it to carry vastly more powerful surveillance equipment (even if you subtract several hundred pounds for the weight of the pilots). It can hold cameras that capture a much larger field of view and zoom in to higher resolution. For about the same amount of money as a ScanEagle, a Cessna offers vastly superior payload capabilities. A Predator has roughly the same cargo capacity as a Cessna 180; it costs about $5 million—much more. (This figure is for a Predator equipped with sensors, which account for about $1 million of the cost.) If you are trying to fly covertly over Waziristan, the steep price premium for a Predator or the performance compromise for a ScanEagle might be worthwhile. Not so if you are flying over Wichita, Kan. Though it doesn’t like to advertise this fact, the FBI maintains a fleet of about 115 surveillance aircraft. (This figure is accurate as of 2010, the most recent year for which the FBI’s budget specifies the number.) Ninety of these are humble-looking Cessnas, both Cessna 180s and the slightly larger Cessna 210. The Cessnas are, according to the 2010 FBI budget, “an indispensable intelligence collection and investigative technique.” They are flown by three teams in eight-hour shifts, providing the sort of 24-hour coverage laypeople associate with drones. Autonomous drones are a long way away. For now, according to the Customs and Border Protection inspector general, it costs about twice as much to operate a drone as it does a manned aircraft. A Cessna equipped with modern cameras, radar and electronic intelligence-gathering equipment is potentially just as large a threat to privacy as a Predator. But it looks a lot less scary and so attracts less attention even than small drones like the Draganflyer, which have far more limited capabilities. There is no doubt that the helicopter plays an important role in shaping today’s world. Offshore oil rigs would be difficult to run without them; they often get severely wounded individuals to a hospital more quickly than any other method; they allow the rich to go skiing in places that are otherwise inaccessible. But helicopters are not everywhere, delivering the mail and serving as taxis. They are where it makes economic sense for them to be. The same will be true of drones half a century from now, when they will have matured as a technology. Drones will no doubt play a larger role than they do today. But they will not fill the skies any more than helicopters have.